You guys, it dipped down to 62 degrees in L.A. this past weekend and I could not have been more excited. 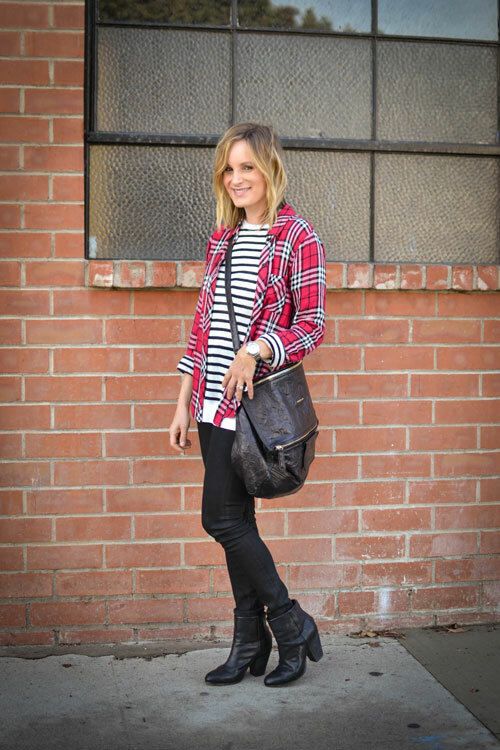 I immediately reached for my favorite plaid shirt that I decided to layer over a long sleeved striped top. I have to tell you that I absolutely love the combination of stripes and plaid together. Oh and in case I haven't mentioned it yet, these black denim leggings have been one of my best purchases to date. Seriously guys, I wear them with everything. After all, who doesn't love a pair of jeans that feel just as comfy as your favorite pair of leggings? Fantastic laid-back outfit! You look so pretty! I love everything about this look! I need to recreate asap! Love the casual vibe and pattern-mixing. I always love mixing prints! Nice look! Amazing outfit! I love the stripes and plaid together. It works really well here!